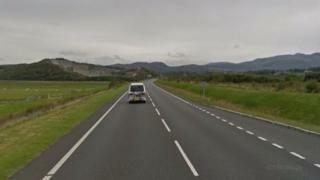 A van driver has been airlifted to hospital with serious injuries after a crash shut one of north Wales' busiest roads. A lorry and van collided on the A487 Porthmadog bypass at about 09:00 GMT, closing the main Caernarfon to Dolgellau road for almost seven hours. The van driver was flown to a major trauma unit in Stoke after the crash near Porthmadog's football ground. The lorry driver was driven to hospital in Bangor with minor injuries. The road was closed while police used a special crane to recover the HGV. Police are appealing for witness and dashcam footage that may have captured the van before the crash.